In light of his upcoming gallery show, I previously took a look back at my favorite Ken Taylor work from over the past few years. In this installment, I'll be listing five prints I hope to see Taylor tackle in the future based on my own personal preference and what I think would fit his style. 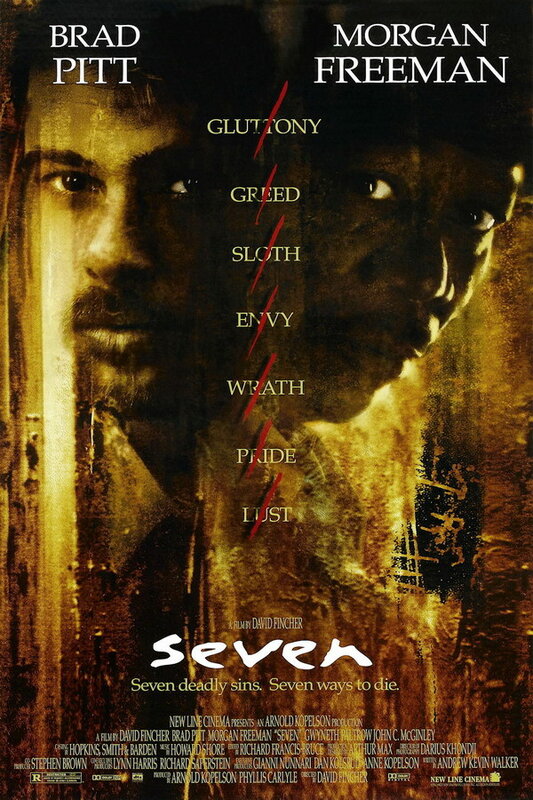 The film "Seven" is a modern classic, with great performances by all involved, especially Kevin Spacey. It also has a wealth of iconic imagery -- the box in the field, for instance -- that would serve as perfect inspiration for alternative artwork. There is so much being said about society and religion in the film that could be thoughtfully conveyed through Taylor's work. His moody compositions, such as the recently teased print for Children of Men, could perfectly capture the feel and themes of the film. While we don't know whether Mondo has the rights to Seven, my fingers are crossed that we one day get to see this happen. Turning to the opposite end of the film spectrum, we have the light hearted and fun "Goonies." For kids of a certain generation, i.e., those born in the late 70s and 80s, Goonies is a film that helps define their childhood. I still remember watching it on TV whenever it was on, and getting lost in their adventure, dreaming that it could someday happen to me. While Randy Ortiz's take on the film is an absolute knockout that is worthy of being hung in any Goonie fan's home, I think Taylor could do something great and different. Similar to the image above, we could get a character piece depicting the Goonies during an adventure. Taylor's recent bright character work for Alice in Wonderland could serve as stylistic inspiration, which would be unique from the artwork currently out there. The original Nightmare on Elm Street is a horror classic. So who better to tackle it than the man that made one of the best Halloween posters ever? While there have been some good entries in the "Nightmare" series commissioned by Mondo, there isn't one as iconic as Taylor's Halloween. Much like his Poltergeist and Halloween, Taylor could surround the piece with impending doom without actually showing it. What makes the film work so well is that it takes something that's supposed to be comforting, and turns it into something terrifying. Taylor's prowess for capturing those themes could work perfectly for the film. Ahhh, the piece that never was, aka Taylor's poster equivalent of Jodorowsky's Dune. As can be seen from the image above, which was part of the Mondo Book Mondonomicon, Taylor created what looks to be a great print for the film that never saw the light of day. Much like Martin Ansin's amazing Studio Ghibli print that got rejected, we may never see a Taylor print for No Country for Old Men. However, based on the above image and the quality of the film, I really hope we do at some point. Since the alternative film print market started expanding in 2010, it has shown no signs of slowing down. It seems like so many iconic films have been tackled, many of them dozens of times. After a while fans are hungry for new properties to be tackled by their favorite artists, and it sometimes feels like many great films already have a perfect alternative print to match. This is particularly true for newer films because likeness and license rights are sometimes easier to bundle together when the studio has both during the initial window it has to promote a new film. However, there are several gaping exceptions to the above, including the Dark Knight. One would think that the most iconic and acclaimed superhero film of the last decade, and maybe ever, would have too many prints. But in reality, there is not one iconic Dark Knight Print that has been released to date. There is no Taylor Halloween, or Moss Star Wars equivalent for the Dark Knight, and it seems like some sort of incredible oversight. Now, Mondo had the license at one point and released a couple of prints, including Olly Moss' timed edition. And don't get me wrong, the previously released prints were all good. But none of them are iconic, and Taylor could be the man to fix that. Take a look at his Man of Steel print. He absolutely nailed the character. It's a simple, beautiful image that completely captures Superman. Think of all the classic imagery in the Dark Knight films, especially Ledger's Joker, and imagine Taylor getting a shot to put that mayhem on the page. Here's hoping we get that iconic print one day.